With the parallel fuses, what would the amperage rating of this disco be?? Last edited by HotLine1; 07/29/12 06:35 PM. 2x the size of the fuse ... nominally. 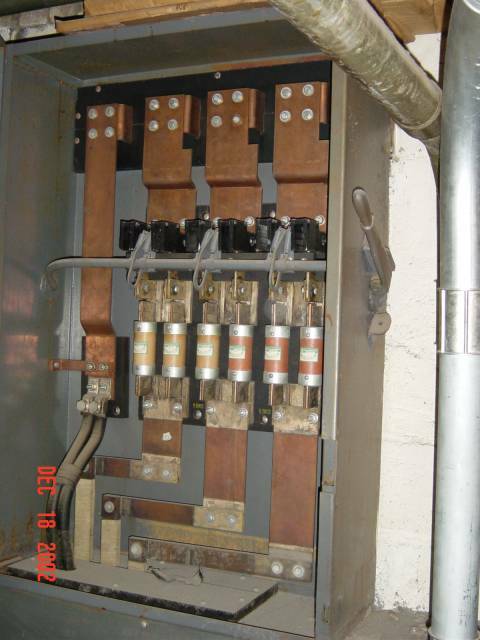 The fuses have to be very closely matched for it to work that way. The chassis to neutral bond is striking as is the apparent lack of any dead front assembly. The neutral is sized to carry only an unbalanced fraction of the return current; hence its reduced cross section. The building this was the main for was gutted in Feb '03, a little over 2 months from when I took this photo. The line side of this 'main' (buss thru back to xfr vault). 'Vault' was determined to be POCO owned, with pots that had a PCB issue. BTW, it was a FPE disco, and the fuses seem to be 'original equipment. We had many discussions on the rated capacity of the parallel fuses. This being the only one I have come upon. Tesla, yes it is 120/208 Y, and I think it dates back to the early 1050s. Occupant was a two story, department store that was the original occupant of the bldg. The electrical distribution, panels, & majority of the wiring looked like '50s, except the IG panel for the POS equipment. Alas, it was all gone; I found this pic in my files. Posted it to get some discussion going. That's some pretty advanced technology for 1050... I would have expected an oil distribution system to be par for the time. OK, ya got me....should be 1950s!! Sorry guys, that is what happens when you don't proof read.